This post is entirely Verity‘s fault. 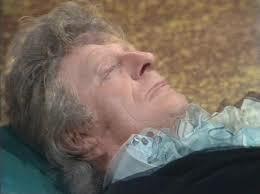 The First Doctor dies, essentially, of old age. In the story – it’s missing, but the novelization and an animated version are available – he grows increasingly weary, leaving the bulk of the action to Ben and Polly. Finally, when the enemy has been vanquished and it looks like everything’s going to be okay after all, he collapses to the ground and fades away. The visual effects are of course of their era, but still fairly effective. One can imagine Ben and Polly’s horror. Nothing like it had ever been seen before. It’s a sad but fitting end for the man who made everything possible. Finally, a proper battle death. Having gone back to face his fear among the spiders, the Doctor returns to die in the arms of his dearest friends. Though he fails to comfort Sarah Jane, his associate K’anpo appears to explain things to her and the ever-unflappable Brigadier. The visuals work decently. 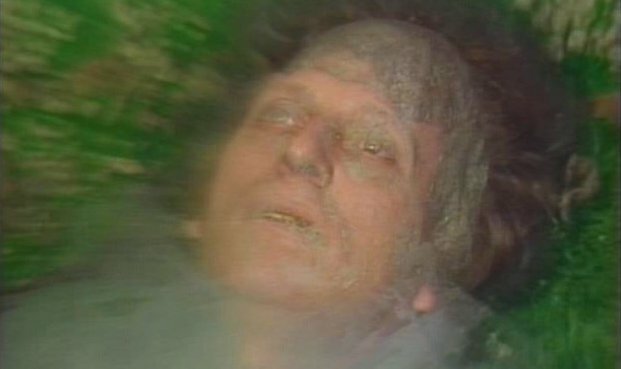 We don’t get to see the Doctor receive his fatal blow, but his death scene is lovely, touching, and appropriately dramatic for the Third Doctor. This one is a bit odd, in that it introduces a mummy-like intermediate stage which follows the Doctor around foreshadowing things for the entire story. The death itself feels anticlimactic: Captain Kirk’s fans know the pain of watching their hero die gracelessly in a fall. The Doctor’s companions manage to be both louder and less convincing in their grief than Sarah Jane. I haven’t seen this one yet. 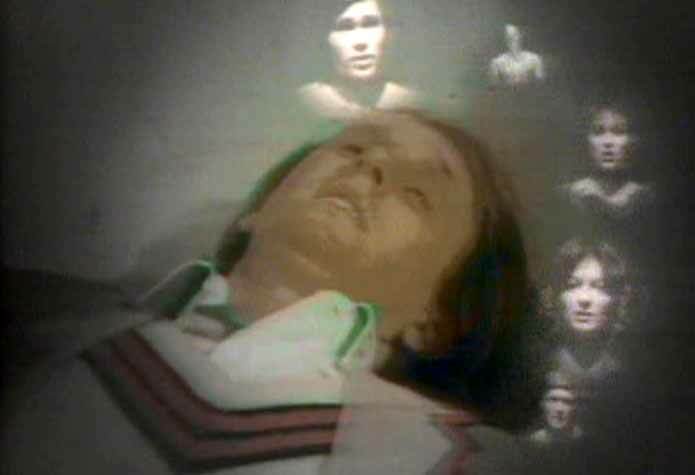 The Doctor dies heroically to save his friend, giving her the last of the antidote to the poison killing them both. I understand fans found it particularly wrenching. Still, it’s a good way for a hero to go. I haven’t seen this one yet either. It’s an odd one, given the Colin Baker kerfuffle, and the anticlimactic nature of Six’s demise. I’m hearing rumors of a retcon in Paul Cornell’s ‘Love and Death’ – I’ve requested the book from the library, and we’ll see if that gives fandom’s least favorite Doctor a more worthy ending. Another anticlimax – if you can call an opening event a climax of any kind. The Doctor steps from his TARDIS and is instantly caught up in a gang shooting. He then dies on the operating table, in the hands of a surgeon unprepared for alien physiology. Given the things the Doctor has survived, this seems particularly disgraceful. However, as the Verities point out, it’s a great beginning for a companion: Grace kills the Doctor, and then becomes his friend. 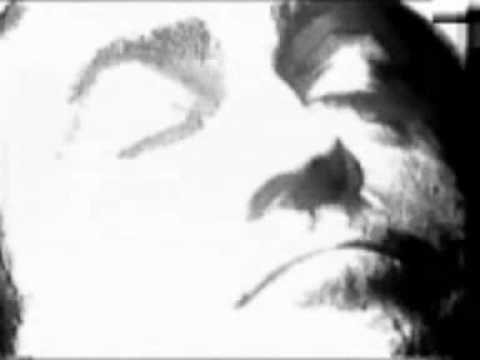 The visuals in this one are unique, which is good because they are also creepy and weird. 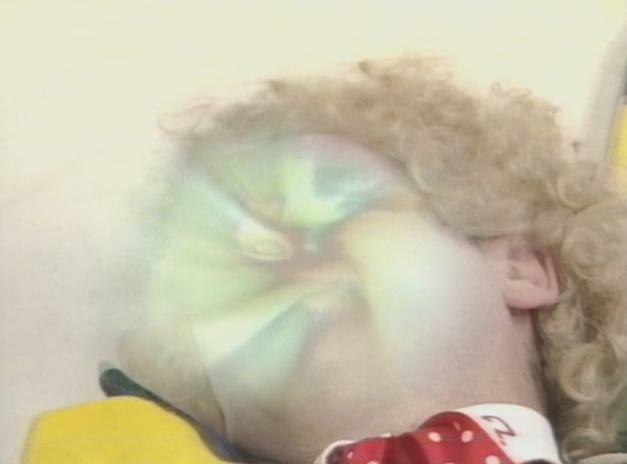 The Doctor’s face, instead of fading, twists and morphs uncomfortably into its new form. I imagine the effects people thought it more realistic – as if there could be anything realistic about a man changing his DNA all in one go. 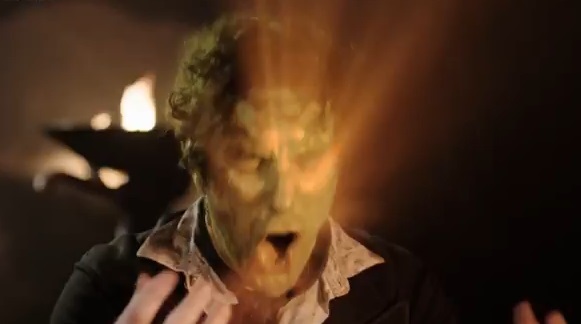 For many years the Eighth Doctor went without a regeneration scene. Then, in ‘Night of the Doctor,’ he is killed in a spaceship crash, refusing to abandon the person he has decided to save – whatever her feelings on the matter. Brought briefly to life by the Sisterhood of Karn, he is offered a choice in his new form. This is the first/third to use the new explosive regeneration effect – first in character chronology, third in actual chronology. 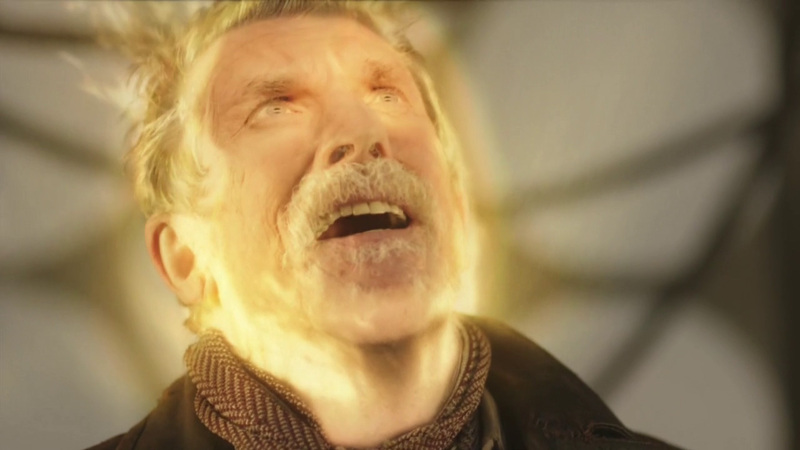 It’s quite a beautiful effect, and the off-camera aspect both lends mystery and allows the use of a very old picture of John Hurt as the War Doctor. This Doctor has lived a long time, and survived an epic and catastrophic war. Age and battle damage weigh heavily upon him. 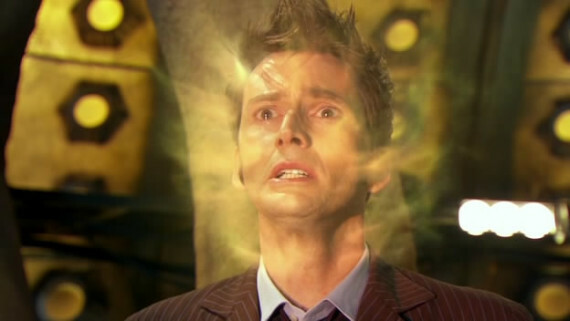 At the end of the 50th Anniversary special, he flies off in his TARDIS and quietly begins his regeneration. Here, Moffat honored Christopher Eccleston’s preference not to appear in the episode. All we see of the new Doctor’s face is a subtle lightening of the eyes. Fans have of course taken it further, adding the rest of Nine’s face to the shot in an assortment of videos easily found on youtube. My first and still my favorite. The Doctor’s gentle explanation to Rose eases the anguish of losing him so soon. The visual effect is beautiful, stunning and terrifying at once, and the new Doctor’s first words restore some of the humor and joy that make travels in the TARDIS so worthwhile. Once again, the Doctor sacrifices himself for his companion, knowing that he will go on. This death allows him to put some of the weight of the Time War behind him, to begin anew, with a friend he cares for deeply by his side. Sorry as I was to see him go, this transition is worthy of its Doctor. 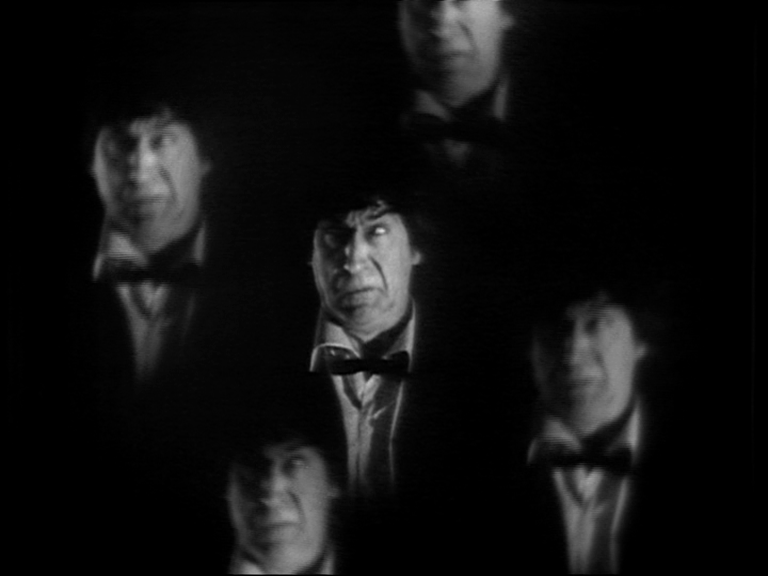 Ah, Ten: the melodrama Doctor. He rails against his death, then in the next moment accepts it, only to postpone and postpone while he visits old friends and says his goodbyes. 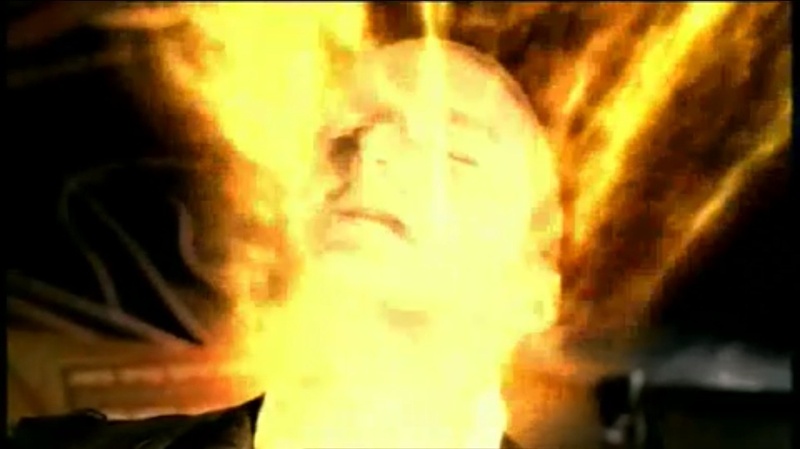 The drama and emotion are at their height, music swelling, as the Doctor and his TARDIS go down together in flames. It’s a wonderful dramatic moment, if you love Ten and the RTD era as much as Tennant and Davies clearly did. Plenty of other fans were left cold. Even some who loved Ten were ready to see him go – and Matt Smith’s first appearance, complete with jaunty music, sets a refreshing tone. Unfortunately, the Eleventh Doctor’s end manages to be both melodramatic and anti-climactic. 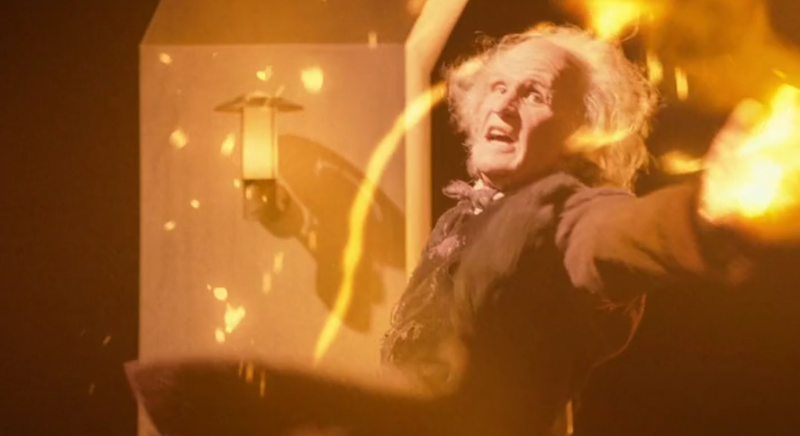 Like the first Doctor, he is aged and battle-weary; however, he neither fades peacefully away nor goes out in a blaze of glory. Instead, he explodes violently, reappears as his youthful self, and then like the flip of a switch he is suddenly someone else. Whether you were tired of him or not, Matt Smith deserved better. It’s important for a hero to have a good death. The point of stories like the Doctor’s is that there is always hope, always meaning, always something good that comes out of the bad. If a Doctor can say goodbye on an optimistic note, his fans can go away happy – and return for the next season. So far he’s managed it more often than not. Sometimes it’s so hard to choose. Sometimes it’s easy. I was thinking of this, I think, because of all the ‘Tooth and Claw’ imagery that pops up on Tumblr from time to time. This episode is really the beginning of the end for Rose. It’s a romp, pure fun in a lot of ways; the two are never more adorable or more obnoxious together than they are here. But you can see the strikes against them begin to accumulate. People have died, and they’re busy taking bets and pranking the Queen. They giggle to each other over their knighthoods while Lady Isobel looks on in agony. Her husband is dead, her household traumatized; while I’m sure she’s aware that Rose and the Doctor prevented a much worse outcome, I doubt she appreciates their levity. But the episode IS a fun one. The pair’s banter is entertaining to follow. Rose is at her most resourceful, the Doctor at his most brilliant. They play off each other beautifully. It’s exciting and scary and smart. And in the end there is Torchwood, and their destiny is fixed. I think this makes ‘Tooth and Claw’ my favorite of S2. It’s got all the good stuff, and a touch of weight that keeps it from ‘Robot of Sherwood’ territory. It’s the heroes’ moment in the sun before darkness falls again. It’s all downhill from here. S2 is not the easiest to choose from, but it’s not the hardest either. S1 gets that honor. The season as a whole is an easy favorite, and in my opinion hits no wrong notes. There are no major turkeys; maybe a flawed moment here or there, but overall every episode is strong, every character whole and complete. Choosing a favorite from among them is hard. ‘Father’s Day’ comes to mind, with Pete’s heroism and the Doctor’s silent sacrifice. ‘Dalek’ showcases Rose’s compassion and humor. ‘The Empty Child/The Doctor Dances’ is a gem of a story. How do I pick just one? S7 is hard again, but for a different reason. There are no really strong episodes in this season. Personally I put ‘Rings of Akhaten’ above the others, because I love the music so much. The storytelling is really not very good. But no other episode has much to recommend it either. S8 is harder than 5 or 6, but not really hard. ‘Mummy on the Orient Express’ stands head and shoulders above the rest, though ‘Flatline’ and ‘Time Heist’ show strongly, as do the opening and closing stories. There’s much more good stuff in here than the last few seasons, though there’s a fair amount of not-great as well. Forget about the classic series; there’s still too much I haven’t seen. However, ‘The Daemons’ (Third Doctor) and ‘City of Death’ (Fourth Doctor) are two that we love so far. ‘City of Death’ is a pretty universal favorite. Four and Romana lark about in Paris, much as Rose and the Doctor do at Torchwood Estate. Humor is paramount. John Cleese makes a guest appearance. But as in much of the classic era, there is no dark cloud to overshadow the fun. The recipients of the Doctor’s and Romana’s digs deserve it, and the pair walk away unscathed and unthreatened at the end. I love the fun ones, but in the modern era at least, I enjoy a touch of the serious too.